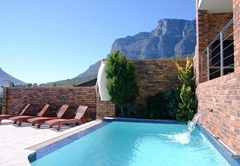 Auberge du Cap is a highly recommended Camps Bay Bed & Breakfast providing accommodation in 4 guest rooms for tourists visiting the Atlantic Seaboard region. 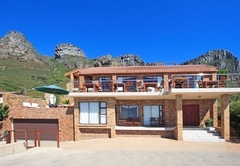 Being in a most sought after position, in the prestigious suburb of Camps Bay, we capture an all encompassing panoramic view of the Atlantic Ocean, shore line, pristine white beach of Camps Bay, Lions Head Mountain, Table Mountain and a glimpse of Robben Island. 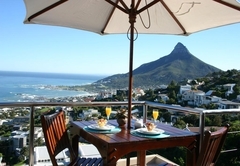 Auberge du Cap offers the discerning traveller a selection of stylish and elegantly appointed Suites and double rooms. 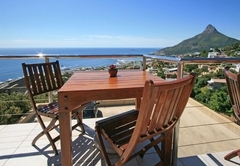 This luxury apartment has panoramic views of the sea and surrounding mountains. 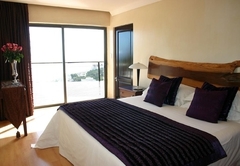 Nouveau Suite comprises of large upstairs bedroom, which flows onto your own sea-facing balcony from where guest can indulge the all encompassing sea views and beautiful sunsets. Extra long King Size bed, adorned in luxury percale linen for your superior comfort. The luxury bathroom has a Jacuzzi spa bath. 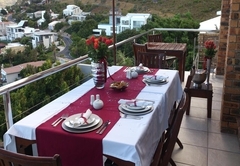 The downstairs private lounge flows onto another private balcony with built in Braai facility, overlooking the pool with stunning sea views!!. 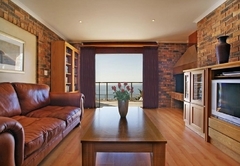 Flat Screen TV, CD player with CD collection, small library and a beautiful sea view to complement this little haven. The stunning well-designed kitchenette, finished in beautiful cherry wood, features a microwave / convection oven, fridge with minibar and tea/coffee making facility. Separate entrance for easy access. 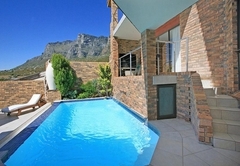 This very spacious, double volume Penthouse Suite has magnificent views of the sea and Lions Head. The large upstairs bedroom with King size bed (can cater for two singles) adorned in luxury percale linen offers comfort and style. 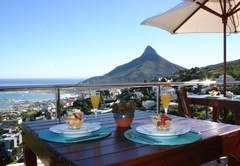 Enjoy the luxury of your own private sea-facing balcony and private wooden deck (on top of the roof) for sipping sundowners, sunbathing and affording you one of the best possible sea and mountain views possible in Camps Bay! The bathroom offers a large shower, double basins, bidet and lovely corner Jacuzzi spa bath with a view over the Nature Reserve and Mountains. The double volume downstairs lounge, with beautiful leather couch, includes TV, CD player with CD collection, small library, fridge with mini bar and tea/coffee making facility. 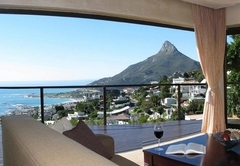 Ocean Suite comprises a lovely spacious bedroom and private lounge, both with truly beautiful Sea Views, as well as a view of the spectacular Lions Head mountain. 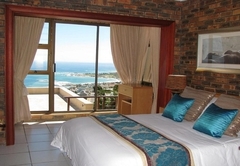 The bedroom has large sliding windows, ensuring full enjoyment of the beautiful sea views. Queen Size Bed adorned in beautiful percale linen, dressing table and stylish decor to enhance your stay. The bathroom is en-suite, with both separate shower and bath. The private lounge features a large flat screen TV, DVD Player, music centre and sofa. 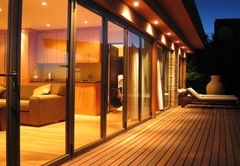 Easy access onto your patio area from both the bedroom and lounge for relaxing outdoors. Ocean Suite can sleep a third person on the sleeper sofa, in the lounge. Air-conditioned for your ultimate comfort, This apartment offers comfortable sleeping for two more persons on a quality double sleeper couch. Bordeaux Suite's beautiful lounge, with warm tones of beech flooring and comfortable furnishings, opens onto a huge wooden deck. An extra large King size bed, adorned in luxurious Percale linen and stylish furnishings all contribute to the quality of your experience. The beautifully finished bathroom, with big shower, double basins, bidet and Jacuzzi bath. 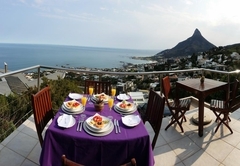 We serve a lovely South African Health Breakfast on the sea facing patio. 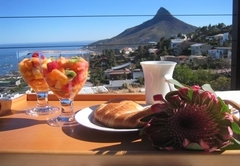 Ideal start to any day with a perfect view of the sea, palm-lined Camps Bay Beach and mountains. Relax and absorb the panoramic views while lounging on the large sunny pool deck with lovely poolside furniture for your comfort. The salt water, rim-flow pool is solar heated to provide guests with a refreshingly pleasant swim after days packed with sightseeing. 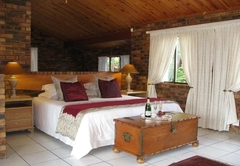 Ideally suited and designed for Honeymooners and Romantics! 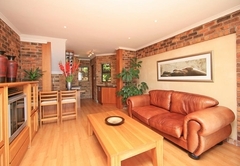 This luxury apartment comprises of large upstairs bedroom with an extra long King Size bed. 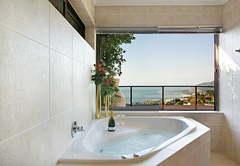 It has a Jacuzzi spa bath as well as an electronic safe, gowns, hair dryer and toiletries for guest’s comfort. 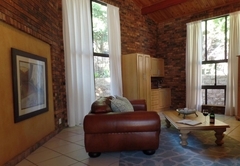 A spacious, double volume Penthouse Suite which has a large upstairs bedroom with King size bed (can cater for two singles) the bathroom offers a large shower, double basins, bidet and lovely corner Jacuzzi spa bath. 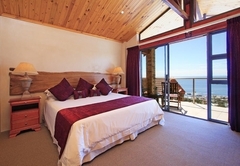 The Ocean Suite has a spacious bedroom and private lounge. The bedroom consists of a Queen Size Bed dressing table and stylish decor. 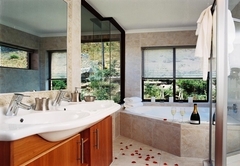 The suite has a full bathroom which is en-suite, with both separate shower and bath. A luxury apartment which offers a main bedroom with a King Size bed as well as comfortable double sleeper couch. The apartment also boasts a beautifully finished bathroom, with big shower, double basins, bidet and Jacuzzi bath. Our stay here was so good we are thinking of staying again when we return 2009. the only reason i have not posted a review earlier was the lack of a P.C.The rooms were fab. the food was great and Mike and Morgan were very friendly and helpful.We had a great time.